Stay active, enjoy friendly competition, and get involved in the community. At Loyola, there's no shortage of opportunities to get moving on our campuses. We've got Division I teams, intramural sports, playing fields, a rock-climbing wall, ropes courses, dance studios, an 18-mile lakefront running and biking trail, and lots of water sports thanks to Lake Michigan. We also have plenty of other activities if you prefer cheering from the sidelines. And that's not all. Our other facilities include Sean Earl Field and Track, two outdoor tennis courts, and a sand volleyball court. You'll want to check it all out during a campus tour. Don't miss your chance to enjoy the excitement of Division I sports, featuring true "student-athletes" with a graduation rate ranking near the nation's best. 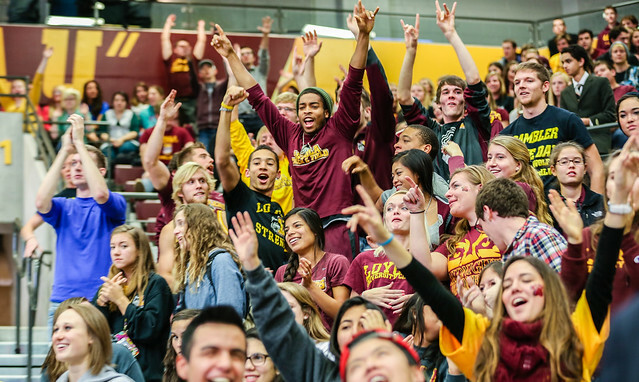 The Rambler Rowdies gives students a chance to support Men's Basketball and cheer alongside a few thousand of their closest friends. It's another great way to have fun while getting involved with student life at Loyola. As the director of the Council of Pan Asian Americans (COPAA) fashion show, I learned about leadership. It was amazing to participate in something so meaningful.